Samphire is a bright green sea vegetable with a salty taste. There are two types: rock samphire and marsh samphire, the latter of which is more widely available. Samphire is often compared to baby asparagus, and its high salt content means that seasoning needn’t be added during the cooking process. Quite often, it is simply boiled or steamed with a little olive oil or butter to create a delicious accompaniment to a main meal. 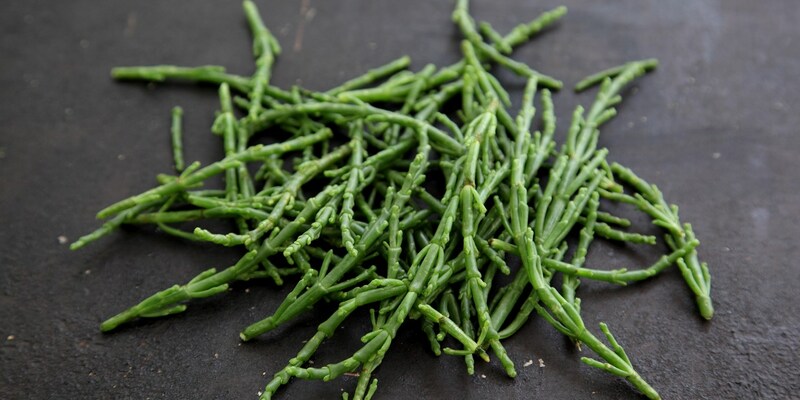 Samphire has a strongly oceanic flavour and, therefore, goes wonderfully with seafood. Dominic Chapman uses the vegetable as a vibrant garnish in his Crab ravioli recipe, while Simon Hulstone uses a combination of samphire and asparagus as a bed for his Fillet of brill in lobster sauce. However, as this collection of samphire recipes demonstrates, the vegetable can hold it own just as easily in earthier dishes, too. Galton Blackiston adds the vegetable to his stunning Bacon, broad bean and samphire potato salad, and Agnar Sverrison enhances his Pork and quince recipe with the unusual texture and flavour of its samphire garnish.